Going up in the world has more than metaphorical meaning for Foresight’s Nigel Aitchison. The partner and head of its environmental division now has his office on the 23rd floor of the Shard – London’s tallest building – six levels higher in the 95-storey office block than the last time we met there a year ago. The need for bigger offices was prompted by business growth that reflects the strength and momentum of the energy-from-waste (EfW) sector, both in the UK and abroad. 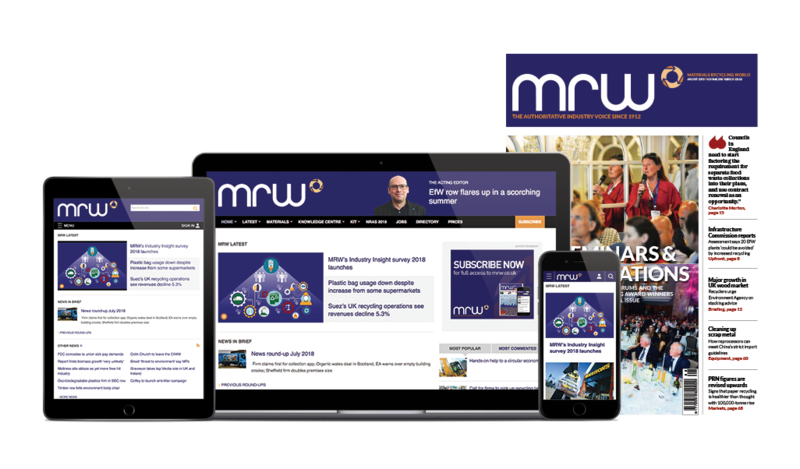 The interview with MRW was sandwiched between trips to Australia, where the Government has established a Clean Energy Finance Corporation along the lines of the UK’s Green Investment Bank (GIB). Foresight is managing its £50m Bioenergy Fund, much as it does the bulk of GIB funds. Aitchison is setting up a small team to run the operation in Sydney and there are also offices in Rome and San Francisco. At home, Foresight has grown from a venture capital and private equity start-up in 1984 to become a major investor through project finance, employing 130 people. There are three divisions, with Environmental headed by Aitchison. Being the preferred principal manager of GIB funds in the past three years has fuelled the division’s recent growth (see box below). In the past 12 months, eight projects have been backed. Foresight has invested around £270m of capital, equating to 750,000 tonnes of processing capacity to come on-stream in due course. Most plants are still under construction. The growth of Foresight’s Environmental division followed a strict decision not to get involved in PFIs or local authority schemes because of the belief that it would tie the business into long-term procurement processes. He says: “That would not have created any momentum. We would have been waiting alongside everybody else for three years to get to ‘preferred bidder’ and another two years to negotiate the contract, if it actually went ahead. We need to do something different. We had capital to deploy. “We have taken a more merchant view on life when investing in projects, and that comes with a different risk profile and a different appetite. You have to be creative in the way you think.” This is ‘Creative Capital’, the company mantra printed on the coffee cups sitting between us. Growth in the UK is ultimately driven by a combination of capital appetite, policy regulation and economics, Aitchison insists: “Where you see a landscape that allows that to happen, that’s a place to be. Where one of those things is not in sync, then it’s difficult to venture into those markets. For Aitchison, ‘things’ are not in sync when it comes to recycling, the core element of the waste hierarchy. He wants a longer-term policy strategy for the UK to help the sector cope with significant falls in oil and commodity prices that could not have been forecast. “You could do certain things when commodity prices were high, which wouldn’t make economic sense today. Quite rightly, the councils are taking that economic view and saying, ‘if I’ve not got a regulation that pushes me to do it, I’ll go with the lowest cost option,” he says. Aitchison believes that, despite rapid growth in some sectors such as EfW, recycling remains the problem area. “I don’t quite know how we solve it without long-term regulation, or a long-term framework that drives those decisions and maybe overcomes the short-term economic cycle that we are presently facing. “I also think that the Government and the long-term policy regulations that could be put in place around recycling haven’t been as bold,” he adds. The landfill tax, he argues, was a piece of legislation that affected everybody equally. But in recent years there has been a reliance on individual incentive schemes such as the feed-in tariffs and voluntary agreements for resource efficiency in different commercial sectors. Aitchison says: “Leaving it to people’s good intentions is going to be challenging because they absolutely will take the lowest cost option – you can’t criticise people, in these sorts of times, for doing that. We haven’t got the same level of equilibrium in terms of recovery and recycling policy. Recycling, I think, needs that fillip – it needs something to bolster it. The picture has been brighter in the EfW sector, and specifically anaerobic digestion (AD), which has benefitted from the GIB’s Recycling & Waste Fund, being managed by Foresight. Its focus is on the smaller projects, such as farm AD schemes and, at the time of writing, still had £45m in the kitty. AD, like most renewable energy sources, has been buffeted by the many changes in Government policy since the 2015 election. But for Aitchison, an expected slowdown in the AD sector will be a feedstock issue rather than policy. Knowing the market and having strong, valid data is key. Investors, chief executives, consultants, planners – and journalists – are frequently at conferences where calls go out for ‘consistent data’ – information collected, publicised and analysed in such a way to allow informed decisions. And he believes it is back to ‘creativity’ when supporting merchants to develop schemes needing investment. Developers have to be treated with caution: they have a natural entrepreneurial spirit, he says, but can be overly optimistic that things will work out better than they do: “One of the things that people have got to appreciate is that it’s not the first pound that is expensive, it’s the follow-on money that becomes expensive. Aitchison recalls examples, sometimes quite small projects, where Foresight had to work hard to make them viable, but the lessons learned are invaluable and the benefits continuing. “The guys did a project with a farmer in Northern Ireland and it took about six months,” he says. “The next one took eight weeks because we had a template. He acknowledges that the company does not have a monopoly on such an approach, but it has contributed within the AD sector to a significant deployment of capital and new processing volume. The downside for some in the growth of AD and EfW plants funded through the GIB is a danger that recycling goes to the back of the investment queue. In effect, materials disappear into the incinerators and pyrolysis plants and are lost for future use. Should the GIB and its fund managers not be more mindful of that? The formal announcement of the privatisation of the GIB came after our discussion, but Aitchison anticipates it by saying he never believed it would be “a long-term hold” for the Government. He sees as positive the promise of an independent share to secure the bank’s ‘green mandate’ as it looked to greater international expansion. All of this means planning, and Aitchison returns to his earlier observation on policy. “We are planning for a future, aren’t we, trying to make investment decisions that will create long-term behaviours. You need a framework of policy and regulation that allows those long-term behaviours to move over the bumps in the road and to smooth out those short-term economic cycles. “The key things for me, and it’s always been the case in the waste industry, are longevity of policy, transparency and a clarity about where the direction of travel is. Unless we have that longevity of transparency, investment decisions are not easy to make. The easiest thing to do is sit on your hands and not make the investment, because nobody can tell you off for that. You can’t get it wrong. Investment managers, though, are not politicians. I wonder what message Aitchison would have for the Chancellor and the relevant secretaries of state if they were ranged around our table, listening in. 2011 £60m Foresight Environmental Fund launched, anchored with a £35m commitment from the London Green Fund, in part funded by the European Regional Development Fund and the London Waste and Recycling Board. 2012 Appointed as the first external fund manager by the Green Investment Bank (GIB) to manage the UK Waste Resources and Energy Investments Fund. 2013 £50m investment by the GIB into a Recycling & Waste Fund managed by Foresight targeting smaller-scale recycling and waste projects across the UK, with a further £50m to be raised from private sector co-investors. To date, Foresight has led investment into more than £750m of UK environmental assets. 2008-present Foresight Group, partner, head of Environmental. Deal origination, negotiation and investment management of environmental assets. Managing expansion into overseas markets. 1999-2008 Shanks Group, director. Responsible for strategy, relationships with key stakeholders, including Government ministers and officials. Advising on PFI bids and acquisition proposals. Led the East London Waste Authority project with contract value of £1.5bn. 1989-99 UK Waste (formerly Wimpey Waste Management). The management of four landfills. Roles in operations, engineering and landfill processes and environmental control.